In 2017, there were only 20 villages with cases of Guinea worm disease in two countries, both in Africa, compared to 23,735 villages in 21 countries on two continents in 1991. “…..Without a vaccine or medicine, the ancient parasitic disease is being wiped out mainly through community-based interventions to educate and change behavior, such as teaching people to filter all drinking water and preventing contamination by keeping patients from entering water sources. When the Guinea worm is ready to come out of the body, it creates a painful burning blister on the skin. When the infected person immerses the blister in cool water to ease the symptoms, the Guinea worm breaks through the blister and part of the worm is exposed. Management of GWD involves removing the whole worm and caring for the wound in general. There is no specific drug to treat or prevent GWD. There is also no vaccine to prevent GWD. The only way to avoid infection is to prevent exposure to the Guinea worm larvae in contaminated drinking water sources. Child immersing foot in water to hasten worm emergence. Photo credit: Louise Gubb, 2007, The Carter Center. 1. First, each day the affected body part is immersed in a container of water to encourage more of the worm to come out. To prevent contamination, the infected person is not allowed to enter drinking water sources. Guinea worm extraction from foot. Photo credit: Emily Staub, 2001, The Carter Center. 2. Next, the wound is cleaned. 3. Then, gentle traction is applied to the worm to slowly pull it out. Pulling stops when resistance is met to avoid breaking the worm. Because the worm can be as long as one meter in length, full extraction can take several days to weeks. Guinea worm extraction from foot—worm wrapped around stick. Photo credit: Emily Staub, 2001, The Carter Center. 4. The worm is then wrapped around a rolled piece of gauze or a stick to maintain some tension on the worm and encourage more of the worm to emerge. This also prevents the worm from slipping back inside. 5. Afterwards, topical antibiotics are applied to the wound to prevent secondary bacterial infections. 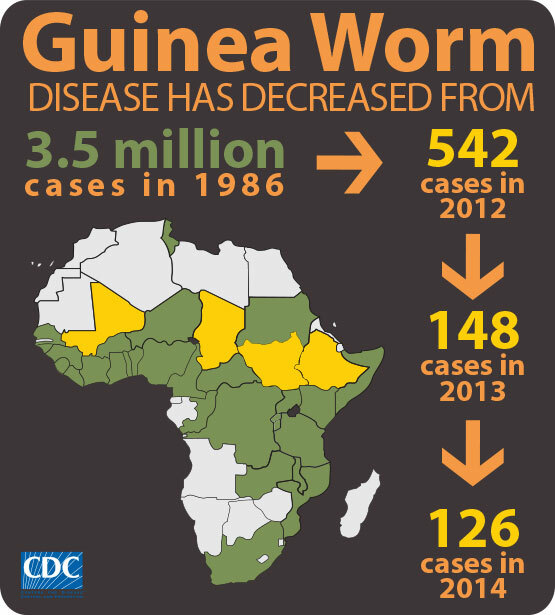 Managing Guinea worm. Photo credit: WHO Collaborating Center at the CDC archives. 6. The affected body part is then bandaged with fresh gauze to protect the site. Medicines, such as aspirin or ibuprofen, are given to help ease the pain of this process and reduce inflammation. 7. These steps are repeated every day until the whole worm is successfully pulled out. 1. Ruiz-Tiben, E. and D.R. 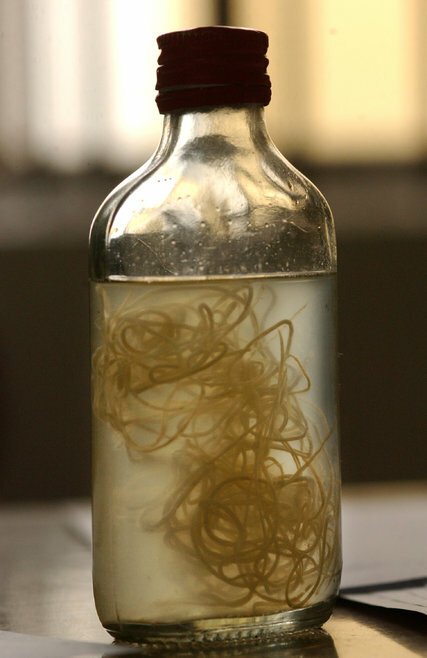 Hopkins, Dracunculiasis (Guinea worm disease) eradication. Adv Parasitol, 2006. 61: p. 275-309.